With more than 1.200 employees and almost 40 specialised companies handling the various aspects of modern communication under one umbrella, the Serviceplan Group is Germany’s largest independent agency network. With additional international branches in Zurich, Paris, Vienna, Milan and Dubai the company has lots of mobile employees using a mix of PCs, Macs, iPads, and iPhones to keep the business moving, so it is critical that the IT department is able to manage both IT worlds with one tool. 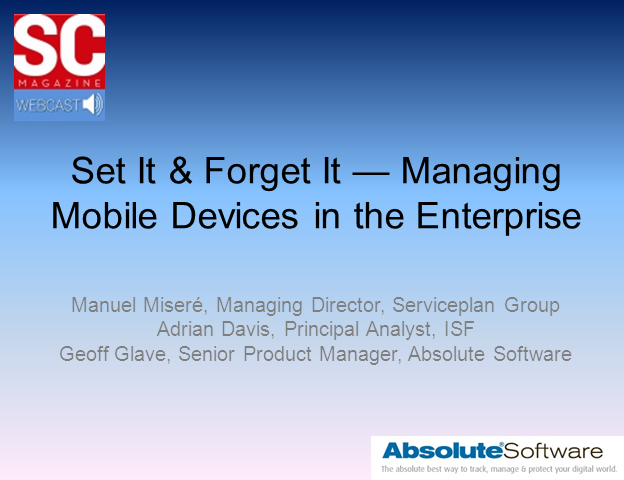 Join Manuel Miseré, Managing Director at ServicePlan alongside a representative of Absolute Software, on Wednesday 14th March, to learn how he implemented an automated process within his corporation so he could "set it and forget it" — freeing up valuable IT resources and allowing them to focus on other high priority projects.